The “Chopped” basket Tom came home with from a Melissa’s Produce event included a box of Melissa’s Coconut Clean Snax with Chia & Flaxseed, Organic Blue Agave Syrup, an Australian Mango and a Yellow Dragon Fruit. 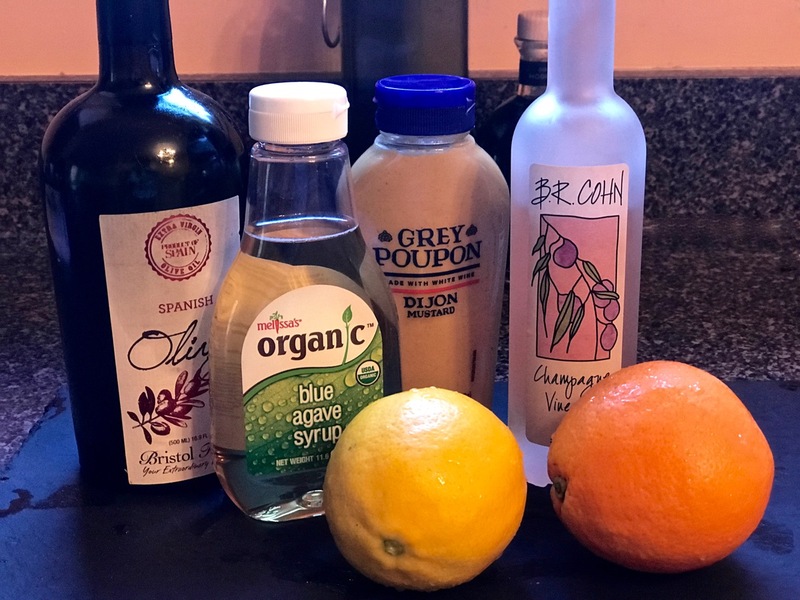 What to make that would be a good complement to the Potato, Fennel and Leek Soup with Tarragon, Pancetta and Seared Scallops I made from the rest of the goodies Tom brought home? 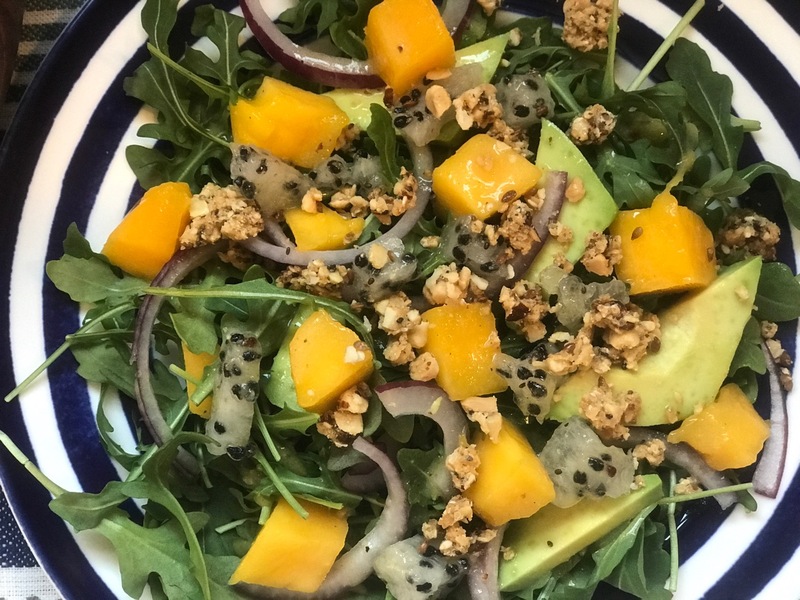 I love salad, and I especially love arugula which seemed like the perfect companions for those above ingredients. Australian mangos are small, sweet mangos that are soft and non-fibrous (they are only available here through March). It was much easier to peel and dice than other mangos I have eaten in the past. In fact, let’s be honest, I hate peeling mangos and always end up buying them pre-sliced. This one was much easier! 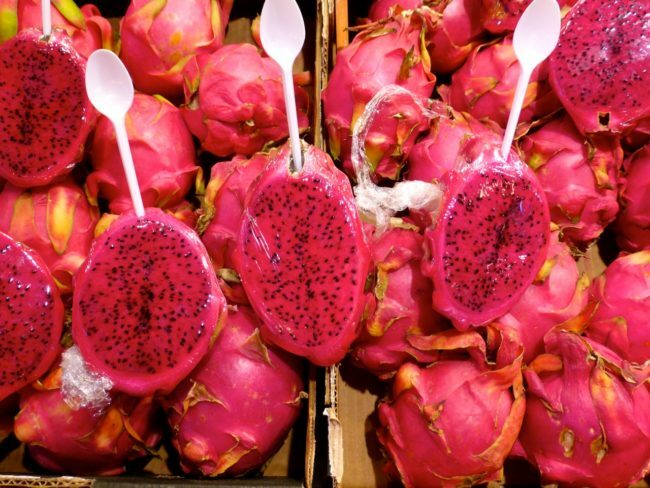 The yellow dragon fruit was a new one to me. 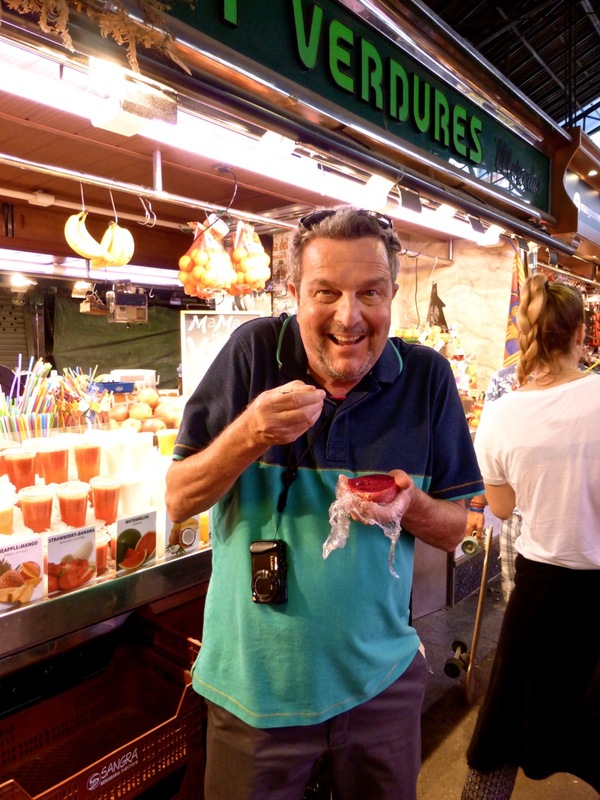 Tom had tried a red dragon fruit at La Boqueria Market in Barcelona, Spain, and while it looked great, it had little flavor. The yellow one, on the other hand, tastes sweeter and mildly like a kiwi. Just scoop it out like avocado and dice. 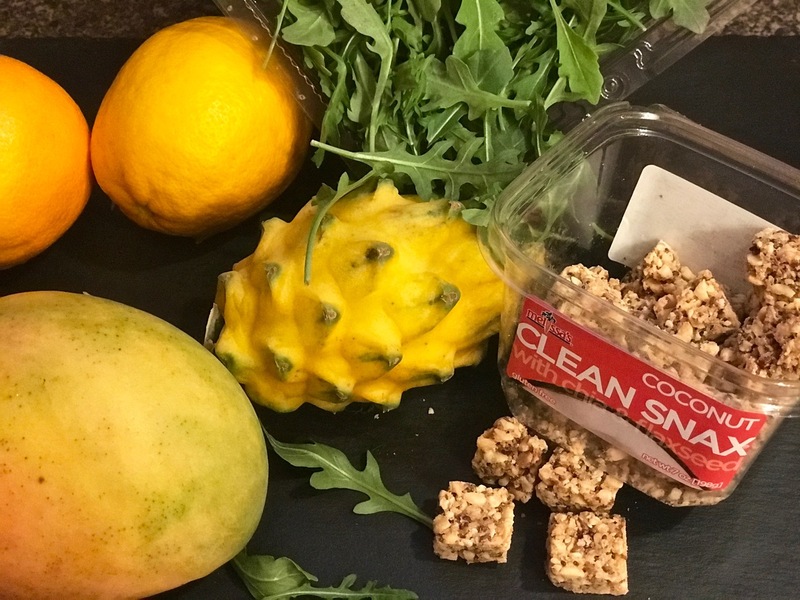 Melissa’s Coconut Clean Snax with Chia & Flaxseed were so good; we almost ate the entire box. (They also contain peanuts so be sure to check the ingredients if you have an allergy.) Fortunately, I saved a handful, which I lightly crushed with a rolling pin and sprinkled across the top of the salad to give it some added crunchiness. 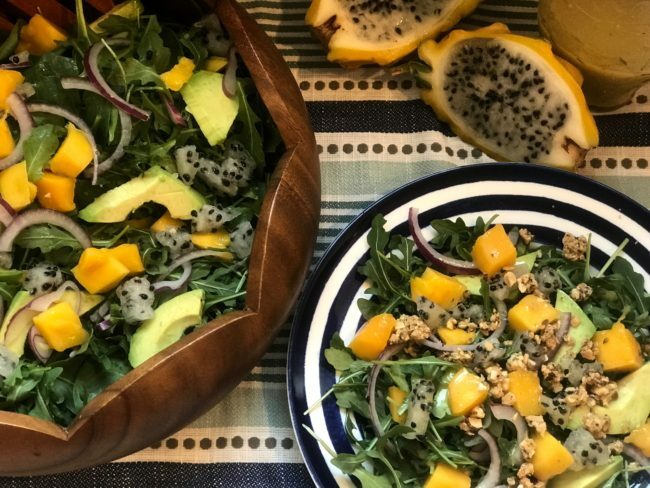 Toss in some sliced avocado, and red onion along with this zesty Citrus Vinaigrette and you have a delicious and nutritious salad. Get part of your Five-a-Day in one meal. Our next door neighbor (who is now our unofficial taste tester) proclaimed this one of the better salads she has ever eaten. Whisk all the ingredients together in a small jar. 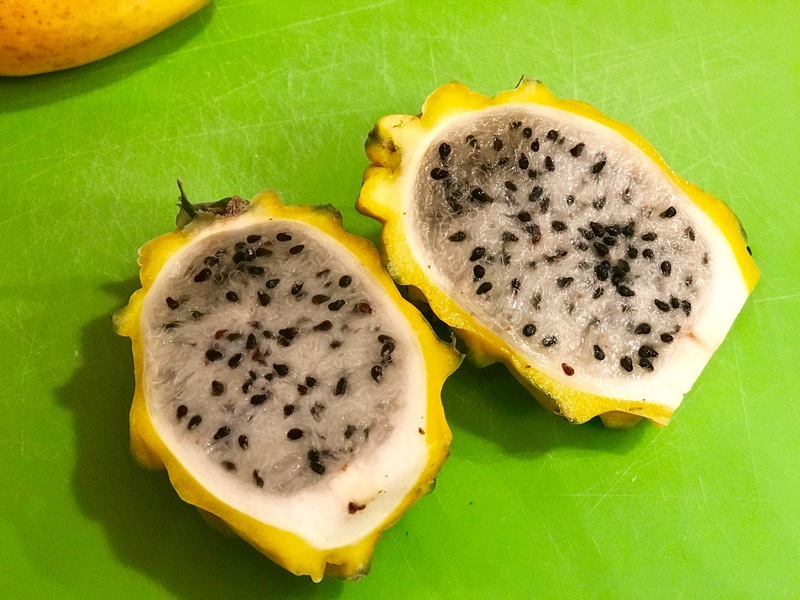 Refrigerate and shake well before serving.